Hydroponics is all about doing more with less. It is of great benefit to those who want to produce flowers, fruits, vegetables, houseplants and other crops using less space than traditional gardening with less input of labor, effort, and energy. It allows total control over a growing environment and plant nutrition, and can often result in a higher yield of better quality fruits, vegetables, flowers and other crops. It is often thought of as being synonymous with “indoor growing.” It is true that most hydroponics gardens are indoors under artificial lights, but you can also grow hydroponically outdoors and in greenhouses. The key factor in determining whether a garden is hydroponics or not is whether the grower provides the majority of the nutrients through water infused with additive nutrients, or whether the crops are deriving most of their nutrients from those found naturally in a soil media or other organic media. The former method is hydroponics; the latter is traditional growing. Hydroponics is a modern agricultural technique that is becoming more and more important for hobbyists and large-scale producers. If growers provide sufficient light, well-engineered nutrients, and appropriate environment to their hydroponics crops, they can expect consistently high yields of quality crops year round. 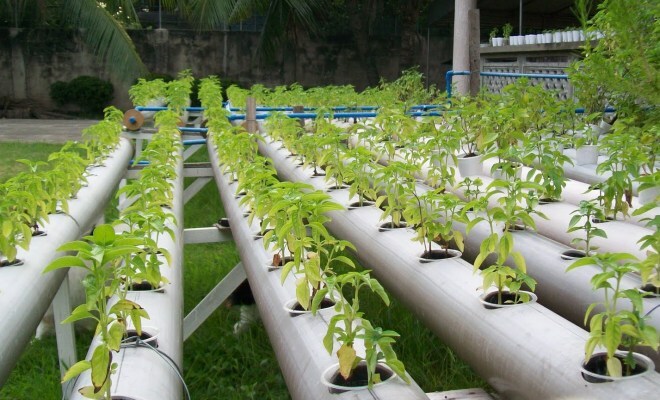 Hydroponics offers several advantages over traditional ways of growing crops. It can help you produce bigger harvests of better quality fruit and vegetables, and a consistent year-round yield that you cannot equal using soil or by growing outdoors or in greenhouses using only natural light. In a hydroponic garden that uses sterile root zone media and has a clean environment, crops aren’t exposed to pathogens and diseases that live in soil. Hydroponic gardening eliminates weeds and other soil-borne problems. Hydroponics gardening can be done more intensively than traditional gardening, with more crop cycles, using controlled environments that maximize growth potential. By growing indoors under artificial light or in greenhouses with manipulation of sunlight, temperature controls, and environmental controls, growers can harvest year round in small spaces and still get profitable yields. Growers can totally control the content and timing of nutrient delivery, which allows them to manipulate crops to achieve more product and higher quality. Hydroponics gardening is the most modern method of producing quality vegetables, fruits, flowers and other agricultural crops, but if you think hydroponics is a new concept, you may be surprised by the long history of hydroponics. 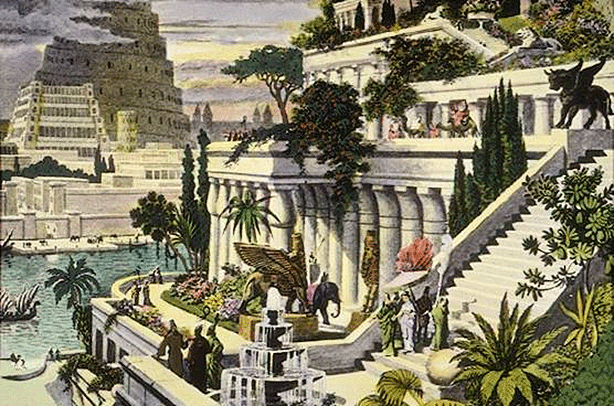 Humans have been growing plants in hydroponics gardens for at least 2600 years, perhaps beginning with the legendary Hanging Gardens of Babylon. The Greek scientists Theophrastus and Dioscorides studied hydroponics 2000 years ago. In the 11th century, the Aztec Nation (which was later totally destroyed by genocide perpetrated by European invaders) created floating gardens in Lake Tenochtitlan in the central valley of what is now called Mexico. Aztecs built rafts from shore vegetation, placed soil on top of the rafts, and floated them in the lake with plants growing on the soil. These rafts were called “Chinampas.” Plants growing on them sent roots through the soil and rafts; the roots fed off the nutrient-rich water of the lake. This may have been a first use of a hydroponics process now called aeroponics, in which plants are fed by water rather than soil. Some Chinampas were linked together into co-joined gardens big enough to be classified as islands- so big that people could walk on them! Early European scientists also explored the idea of using water as a primary medium for plant roots and did other research to figure out how plants grew. In 1600, Jan van Helmont planted a one-pound willow shoot in a pipe containing 200 pounds of dried soil in Belgium. Five years later, the willow shoot weighed 160 pounds, but there was still 200 pounds of soil in the pipe. Van Helmont could not figure out how the willow got so big, because scientists were not yet aware that plants absorb nutrients through water and air. A century later, Englishman John Woodward mixed water and soil as a root media. He’s credited with being one of the first people to figure out that plants absorb nutrients from soil and water, and some assert that his water-soil combination qualifies as the first hydroponic plant food. Soon thereafter, other Europeans discovered the function of roots, transpiration, nutrient uptake, carbon dioxide absorption from air through leaves, and absorption of oxygen through roots. English researcher Joseph Priestly is the creator of the first CO2 enhancement chamber. He found that plants in a chamber filled with carbon dioxide gradually transform the carbon dioxide into oxygen. He also discovered that sunlight rapidly increased this transformation, which was an early indication of what was later called photosynthesis. By the early 20th century, scientists had precisely analyzed minerals and other materials necessary for plant growth; they’d also devised liquid nutrient formulas that substituted for soil nutrients. Before 1924, hydroponics was called nutriculture, chemiculture and aquaculture. In 1924, Dr. William F. Gericke of the University of California (often referred to as “the father of modern hydroponics”) created the word hydroponics to describe growing crops in non-soil media and nutrient-enriched water indoors and outdoors. The green-thumbed professor grew hydroponic fruits, veggies, root crops, ornamentals and flowers. His tomato plants attained heights of 25 feet, producing tomatoes the size of grapefruits! During World War II, the US and British militaries used hydroponics to grow hundreds of thousands of tons of food for soldiers in remote locations where conventional farming was impossible. After World War II, the military continued to use hydroponics. For example, the American army grew eight million pounds of fresh hydroponic produce in 1952, most of it in Japan. By the 1960’s, hydroponics agriculture had become a major industry worldwide, especially in parts of the US such as Florida, California, Hawaii, and Arizona, and in Russia, France, South Africa, the Middle East, Holland, Japan, Australia and Germany. A recent Australian government report estimates that 65,000 acres of high-intensity legal hydroponic production exists worldwide, with a value of six billion to eight billion US dollars per year. Analysts cited in the Aussie report say global warming, desertification, water shortages, oil shortages, and globalization are making hydroponics increasingly important. The report notes that the industry has achieved phenomenal financial and technological success in a relatively short time, and that its value has a faster doubling time than almost any other category of the world agricultural economy. In addition to the commercial use of hydroponics, many amateur or small-scale growers are using hydroponic systems in gardens, on windowsills, in basements, greenhouses and spare rooms. The US Navy grows hydroponic vegetables on submarines, and NASA has long attempted to perfect hydroponic systems that could provide oxygen and food for people on long space flights. 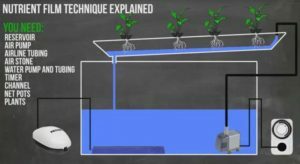 There are several ways to grow hydroponically, and some growers are fortunate to be able to experiment with these different methods to see the advantages, disadvantages and production results of each. The Ebb and Flow system features plant pots filled with sterile grow medium inundated with nutrient-rich water for a few minutes every hour. Often, the pots sit in an upper reservoir that drains into a lower reservoir. The most commonly used grow medium for Ebb and Flow gardens are rockwool, perlite, vermiculite, and lava rock. Drip systems use an irrigation approach that relies on drip emitters suspended just above the root zone. These emitters come in varying shapes, sizes and spray patterns, so growers can use the emitters to regulate the amount of moisture reaching root media, and how the moisture is distributed spatially. Drip systems can be fine-tuned in conjunction with temperature and humidity to create a near-continuous feed cycle that pours lots of nutrients and water into plants to produce growth. One very technical system of growing is known as the Nutrient Film Technique (NFT). In this method, plants are placed in narrow grow channels that sometimes resemble a long pipe cut in half horizontally. A “film” of nutrients in contained in water in the bottom of the channel where roots are dangling. 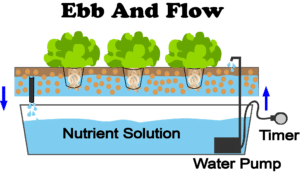 In NFT, an abundance of oxygen is drawn in through the top of the roots and through the irrigation solution as it passes by the lower parts of roots. The irrigation sprayer is activated much of the time by necessity, because the plant roots are hanging in the bottom of the channel with no media around them to keep them moist. NFT is a high maintenance, temperamental, but extremely productive method of hydroponics growing. The easiest type of hydroponics garden to set up is a passive system in which plants sit in their pots or in an apparatus that allows their roots to hang in a weak reservoir of nutrients. This system has no moving parts, pumps, emitters or other complications, but it often has a problem with low amounts of oxygenation in the reservoir, which can slow plant growth. It is the least flexible of any of the four systems mentioned here because it is virtually impossible to microadjust feed rate and concentration. A more difficult form of gardening, but one which is very high-tech and efficient, is the aeroponics garden. This type of garden is somewhat similar to the NFT method. Many gardeners put their plants in trays or pots that are filled with a dense water-holding substance like rockwool, sphagnum moss, or coco coir. 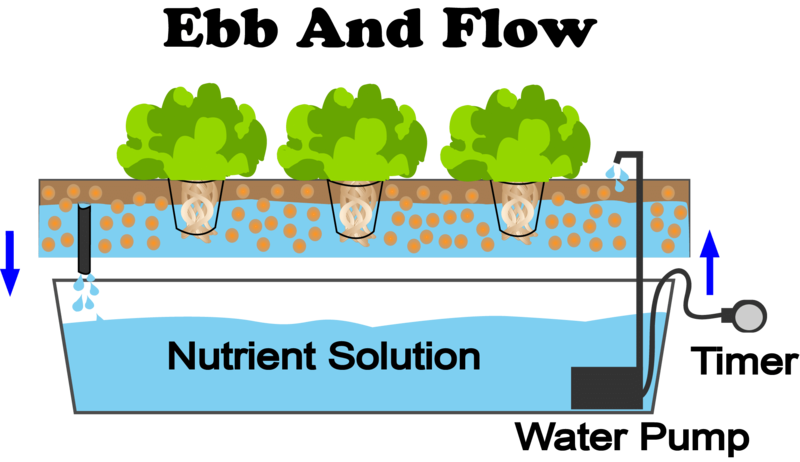 Nutrition-rich water is supplied to the root zone media, which holds plants firmly in place while retaining a storehouse of nutrients for uptake by roots. The aeroponics method bathes plant roots in an aerosol spray of nutrition and water. Roots hang in the spray area and the plants are supported by rubber gaskets. The system provides a huge amount of oxygen to roots, and also negates the need for lots of root space, because delivery of nutrients is so efficient. You’ve noticed that hydroponics means “without soil.” In a soil garden, plant roots are supported by soil that encases the roots while the roots search through the soil for food and water. In hydroponics, the roots search through other types of non-soil media that contain no nutrients until growers put the nutrients there. These media are often referred to as “sterile,” because they are either manmade or otherwise contain no nutrients in and of themselves. These sterile media, such as rockwool, cocopeat, carbonized rice hull, perlite, floral foam, and vermiculite, are used because they can absorb nutrient solution, time release it, release moisture, buffer nutrient solution, and support plant roots in a manner that is pH neutral, porous and ideally suited for the complementary relationship between root media and roots. Energy saved when roots don’t have to work so hard is channeled into above-ground plant growth and larger yield. Better yet, the roots work less hard to absorb more nutrient than they would if they were being grown in soil. 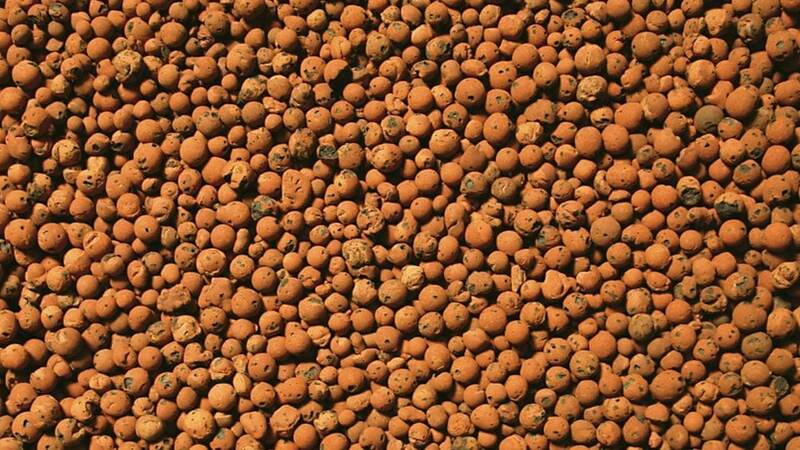 Hydroponic non-soil root zone media include cocopeat, carbonized rice hull, perlite, hydroton clay pebbles, vermiculite, sphagnum or peat moss, rockwool, vermiculite, floral foam, pumice and volcanic rock. Perlite, rockwool, clay pebbles and cocopeat are the most popular choices. Perlite and Vermiculite are made when volcanic rock is heated until it explodes like popcorn, resulting in the porous, white Perlite pebbles. Perlite can be used loose, in pots or bagged in thin plastics sleeves, referred to as “grow bags” because the plants are grown right in the bags. Plants in perlite grow bags are usually set up on a drip feed system, and can be hung horizontally along walls and ceiling, or in coliseum fashion, to maximize grow spaces. Rockwool is a very popular product used by tens of thousands of hydroponics growers, from the most unskilled amateur to the largest commercial producers. It’s made by heating basalt to create rock fibers that are spun to make cubes and slabs of various shapes and sizes. In production, rockwool cubes are used for seed germination, cloning, and early vegetative plants, and the slabs are for serious finishing and larger plants. Some growers break up the slabs or buy bales of rockwool so they can put rockwool into pots or other holders. Rockwool is easy to work with, but must be pre-soaked to adjust pH and should be handled with care, since its tiny fibers are manmade and can very irritating if they get on skin, similar to asbestos. Expanded clay pebbles and volcanic pebbles are similar in use and function in ebb and flow systems and in pots. These pebbles have neutral pH and are able to quickly take in and release water. They are often made too large to be used alone as a growing medium. That’s why they are often combined with other sterile media, such as Vermiculite, Perlite and rockwool. Expanded clay pebbles have a neutral pH and excellent capillary action. Often Ebb and Flow systems use expanded clay pebbles in the grow pots as the growing medium. 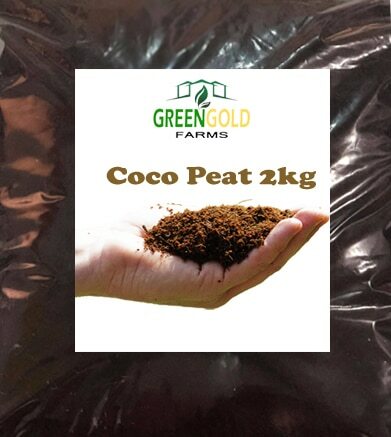 Cocopeat (coco coir) is gaining popularity for several reasons. The coconut and its coir (the shell that surrounds the inner fruit of a coconut) contain many phytohormones and other bio-stimulants that are beneficial to crops. Coir is also beneficial because it is a tough, durable substance that is able to resist ongoing pollution or degradation from nutrient salts. The coconut is teeming with naturally occurring growth hormones and other bio-stimulants that are inherent to the survival of the species, which fortunately for growers may be found in the fibers surrounding the “seed” which may be processed for use as a growing medium. As with peat, there are factors affecting the quality of use of the coir as a growing medium. The origin and age of the parent material largely plays a role in the fiber qualities. Coconuts harvested when fully mature contain more lignins and cellulose. These fibers are tough and durable enough to manufacture rope from. Interestingly, coconut fiber is the only natural fiber resistant to breaking down in salt water. This helps make it ideal for indoor gardeners because nutrient solutions can erode growing media, even in the time it takes to grow just one crop. Coconuts harvested when fully mature contain more lignins and cellulose. These fibers are tough and durable enough to manufacture rope from. Interestingly, coconut fiber is the only natural fiber resistant to breaking down in salt water. This helps make it ideal for gardeners, as nutrient solutions, particularly popular inorganic varieties and the salts they contain, play a role in the aging of root zone medias over the course of the crop. Many growers say that cocopeat is a cost effective media because it can be re-used for several crop cycles longer than rockwool and other media can be re-used. Nitrogen (N) is a main nutrient and is a major component of proteins, which form an essential part of protoplasm and also occur as stored foods in plant cells. Nitrogen is also a part of other organic compounds in plants such as chlorophyll, amino acids, alkaloids and some plant hormones. Signs of nitrogen deficiency: older leaves turn chlorotic and may eventually die; plant is stunted; foliage is light green. If you are overfeeding nitrogen, plants grow too vigorously, with long internodes, leaves become dark green, flowers elongate rather than thicken, and ripening is delayed. Phosphorous (P) is a component of plant proteins, phospholipids, sugar phosphates, nucleic acids, ATP and NADP. The highest percentages of phosphorous occur in the parts of the plant that are growing rapidly. Phosphorus is a macronutrient, as are Nitrogen and Potassium. Phosphorus deficiencies manifest when stem, leaf veins, petioles turn yellow, followed by reddish-purplish as phosphorous is drawn from them into new growth. Phosphorus deficiencies can cause seedlings to develop slowly. Phosphorus deficiency delays fruiting/flowering; fruits/flowers can be stunted by phosphorus deficiency. Potassium (K) accumulates in tissues that are growing rapidly. It will migrate from older tissues to newer growth. For example, during the maturing of the crop there is movement of potassium from leaves into the fruit. Plants in floral phase need extra amounts of P and K and lesser amounts of N.
Deficiency signals are present when older leaves appear chlorotic between veins, but the veins themselves remain green, and/or when leaf edges burn and curl up. Another sign of deficiency is poor production of fruit or flowers. Calcium is one main ingredient of plant cell walls, where it occurs in the form of calcium pectate. It is essential for plant structure and function and is often insufficiently supplied, especially for plants in floral growth cycle. If calcium supply is insufficient, plants grow more slowly, young leaves yellow, and flowers are small and poorly formed. Sulfur forms part of protein molecules important for structural growth and metabolism. Magnesium is a building block of chlorophyll, and of course chlorophyll is essential in the process of photosynthesis that converts light into energy and growth. . Chlorophylls are the only major compounds of plants that contain magnesium as a stable component. Many enzyme reactions, particularly those involving a transfer of phosphate, are activated by magnesium ions. Most general hydroponics plant foods do not contain adequate amounts of magnesium. Deficiencies show up when older leaves curl and yellow areas appear between leaf veins. Deficiencies also manifest when younger leaves curl up and become brittle or dry. Iron is another key constituent of plants that is underprovided in most fertilizers. A number of essential compounds in plants contain iron, and iron plays a role in energy conversion, photosynthesis and transpiration. Iron can interfere with uptake of other nutrients, and is often improperly configured in many fertilizer products. Boron facilitates carbohydrate breakdown. Symptoms of boron deficiency include stunted roots and shoot elongation, lack of flowering, darkening of tissues and growth abnormalities. Zinc is important for sustained growth of cells, but can be problematic if it builds up in the root zone due to poorly-made nutrients. Manganese activates enzymes that fuel oxygen processing and other metabolic processes. 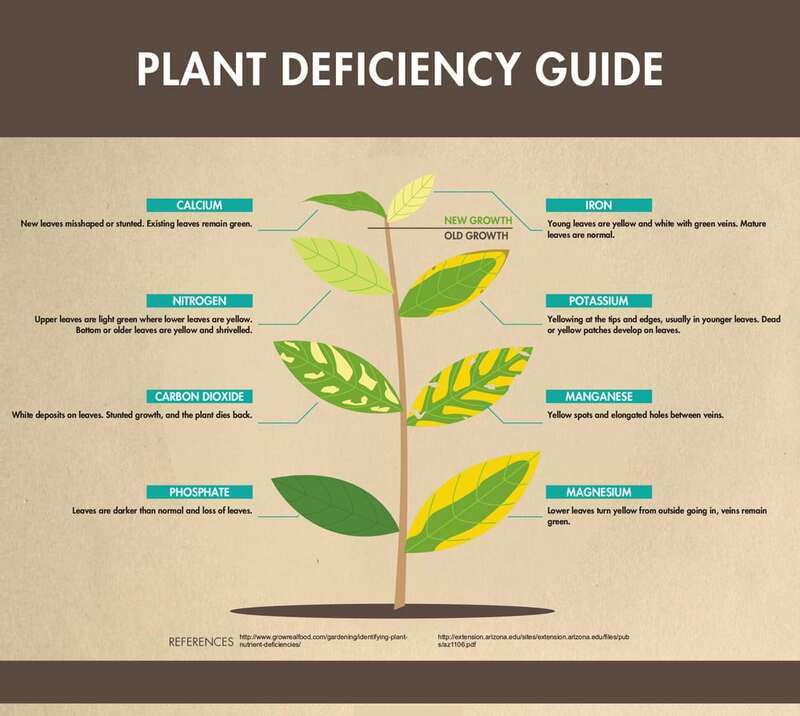 If there’s a manganese deficiency, plants grow slower and are more likely to succumb to disease. The most obvious sign of a manganese deficiency is chlorosis. Manganese chlorosis results in the leaf taking on a mottled appearance. Copper is important in the formation of enzymes, which are key to metabolism, nutrient uptake, photosynthesis, and growth rates. Molybdenum is important for enzymes that help nitrogen fixation and nitrate reduction. Plants suffering molybdenum deficiency absorb nitrate ions but are unable to properly metabolize nitrogen, resulting in severe growth problems.